NIU’s Kathi Bennett era took another step forward Monday as the women’s basketball team had its first practice under the Huskies’ new coach. Bennett put the team through the paces for just over two hours, much of which surrounded developing her new team’s identity. Renowned as one of the best teachers in women’s basketball, Bennett has achieved a career record of 296-178 (.624) in 17 years on the bench. Monday’s practice was her first as a head coach since 2005, her final year at Indiana before taking a health-related leave from the profession. If Bennett was nervous, it didn’t show on the court, as she professed attention to detail and fundamentals. Bennett also put in the first pieces of her trademark ‘pack’ defense, a system vastly different than the Huskies’ previous scheme. 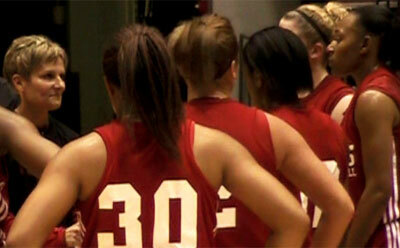 After one full practice, Bennett was impressed by her team’s thirst for knowledge and will to improve. The Huskies return three starters: All-Mid-American Conference performers Marke Freeman and Ebony Ellis, and Shelton, who started every game of 2009-10. Four other returning letterwinners and five newcomers round out a roster that is picking up the pace on the practice floor, while coming together as a team. Tickets for the 2010-11 season are on sale now, and can be purchased by calling (815) 752-6800 or online at NIUHuskies.com. The Huskies start the year, Nov. 10, with an exhibition at home against UW-Parkside. The regular season opener is set for Nov. 13 at Minnesota.